Well, he tried, and helping people “understand the physical behavior of the bicycle with minimum use of mathematics” is an admirable goal, but I am afraid this misses the mark. After chapters on “Momentum-impulse”, “Work-energy-power”, and even “Temperature and heat”, oh my, the trouble starts in chapter 10 on “Rotational motion”, specifically section 10.7 on the “Role of angular momentum in a bicycle”. Prof Connolly starts with a warning that “angular momentum is a very important physical concept,” which “is commonly misunderstood and applied in a flawed manner,” and then he immediately proceeds to misunderstand it and apply it in a flawed manner. He continues with the example of a “simple hoop,” which “remains upright” “as long as it is rolling,” but he completely misunderstands why. Then he incorrectly asserts that the reason a rolling hoop stays upright does not apply to bicycles. The reality is that a rolling hoop stays upright because gyroscopic precession causes it to steer in the direction of a lean, just as with the front wheel of bicycles. Of course, on bicycles, gyroscopic precession is neither sufficient nor necessary for self-stability because there are other factors at play, but that doesn’t mean it doesn’t play an important role. More on that later. The trouble continues in chapter 11 on “Torque-applications to the bicycle”. Prof Connolly employs plenty of math when he analyzes wheelies and headers, but oddly obscures the importance of center of mass location relative to the rear or front wheel by immediately using lengths instead of variables so that the relationship cannot be seen in the result. Sure, the pedal force and the coefficient of friction are also important factors, but so is the center of mass location. I suppose this oversight can be chalked up as simply an editorial choice, but the elegant result relating center of mass location to coefficient of friction was so close, it seems a shame to leave it unstated. The main event, however, is chapter 12 on “Centripetal acceleration-turning and bicycle stability”. He does correctly point out that bicycles stay upright by steering in the direction of a lean, that a bicycle that cannot steer will not stay upright, and that many bicycle can exhibit self-stability. When the TMS bicycle falls, the lower steering-mass would, on its own, fall faster than the higher frame-mass for the same reason that a short pencil balanced on end (an inverted pendulum) falls faster than a tall broomstick (a slower inverted pendulum). Because the frames are hinged together, the tendency for the front steering-assembly mass to fall faster causes steering in the fall direction. This is a dynamic phenomenon, which can be explained in a single sentence, but a static explanation just doesn’t cut it. The benchmark bicycle entirely loses its stability if it is only changed by the removal of the wheel gyro terms. The benchmark bicycle has no stable region when the gyro is removed. That seems pretty clear, and this glaring omission should be the nail in the coffin of “Understanding the Magic of the Bicycle”. That may seem harsh, and Prof Connelly, who seems like a very nice man, probably didn’t go through all the effort of writing a book just to make money, but can we say the same about the publishers, IOP Concise Physics? They are part of IOPscience, which also published the misguided “On the stability of a bicycle on rollers” in their “European Journal of Physics” that I discussed back in October 2014. It seems that they really need to find an editor that understands bikes and/or just stop publishing books and articles about them. The argument has stretched for weeks over on KQED, and I believe Calvin has finally revealed enough about his model for me to find a fatal flaw. As previously reported, Calvin argues that the net ground reaction force acting on a bike as it leans must remain aligned with the midplane of the bike. This then means that the ground reaction force cannot create a moment about the steering axis through trail. With gyroscopic effect already minimized, and trail now neutralized, Calvin’s tire theory can come to the rescue. The problem, however, is that the net ground reaction force does not remain aligned with the midplane of the bike unless the bike is modeled as a point mass on a massless rod. As soon as a finite mass distribution is considered, Calvin’s fundamental premise falls apart. In an effort to induce Calvin to concede this flaw, I have derived expressions for the ground reaction force orientation for two different mass distributions: a point mass and a uniform rod, and asked Calvin to point out any flaws in my derivation. So far, he has not managed to find any, and has simply reiterated his reasoning instead. Therefore, I have done my best to follow his reasoning and find where it goes awry. It turns out that Calvin appears to have made a common undergraduate mistake by forgetting to use the Parallel Axis Theorem when he inserts the mass moment of inertia into his derivation. There we have it. Time will tell if it has any impact on Calvin’s thinking. I suppose I should apologize for the long silence, since continued postings are what drives blog traffic, but things have been fairly quite in the world of bicycle science, and I didn’t have anything that needed highlighting. Or so I thought. It turns our that our old friend Calvin Hulburt, first mentioned here back in 2014, has remained busy since then. He posted a long screed with pictures and everything in answer to questions on Quora here and here, and even gets a little feisty on KQED when he refers to the current active group of bicycle dynamics researchers as “Whipplites”. Sadly, he still has nothing new to offer. Despite our pleading with him on the Single Track Vehicle Google Group to make a testable prediction, he declines to do so. Instead, he simply continues to push his theories in venues where they can go unchallenged. I guess now the task includes creating user IDs on each of those sites, logging in, and posting a reply. Sigh. Update: Well, Andy Ruina tackled Quora, and I took on KQED. The discussion has been busy on KQED, and Calvin has finally made some testable assertions, but we seem to have come to an impasse. One of these assertions is that the net ground reaction force in a lean is always aligned with the midplane of the bike, and this means that it cannot create a steering torque via a finite trail. I counter that this is only true if the bike is modeled as a point mass on a massless rod. If the mass is distributed, as on a real bike, the net ground reaction force no longer aligns with the midplane. We need to look at equations to sort things out, the most efficient way to do that is with attached images, and KQED keeps deleting my comments that contain images, so I’m posting them here instead. So the equations do support the notion that the net ground reaction force is perfectly aligned with the midplane of a bike, if the bike consists of a point mass on a massless rod. Note that f = Ntanθ, where f is the horizontal ground reaction force, N is the vertical ground reaction force, and θ is the roll angle; not f = Wtanθ as Calvin indicates in his diagrams on Quora. N only equals the weight, W in Calvin’s diagram, when there is no motion. The shape and mass distribution do not enter into the linear momentum balance, and since the weight and applied forces remain the same, so do those equations. The only difference is in the angular momentum balance, which produces the slower acceleration. When the equations from linear momentum balance are combined with the equation from angular momentum balance, the single difference propagates into the horizontal and vertical components of the ground reaction force such that the resultant net ground reaction force no long aligns with the midplane of the bike. At long last, this means that the ground reaction force, combined with a finite trail, can generate a steering torque and cause the front wheel to steer towards the direction of the lean. My very first post, about a web page published by the University of Wisconsin Madison Physics Department, has finally become obsolete. After I contacted the chair of the department by email, I head back from the person in charge of the page. He explained the constraints placed on content by their intended audience, and I suggested they merely not mention bicycles or motorcycles at all. He agreed, and now there is one fewer source of bad motorcycle science on the internet. Only a couple dozen to go. The number of errors in this article by Owen Edwards, apparently aimed at educators, helps explain perhaps why so many misconceptions persist in the public mind. In fast turns, lean angle and forward motion counteract the powerful pull toward the outer edge of the track. the initial physics lesson to be learned watching a racing bike hurtle into a tight turn is Newton’s first law of motion: “Every object persists in its state of rest or uniform motion in a straight line unless it is compelled to change that state by forces impressed on it,” explains Falco. To a rider, this means that the faster a motorcycle is going, the less it wants to turn. The truth is that a a bike’s inertia, the property which does resist acceleration according to Newton’s 1st law, is constant, and a lateral force, such as friction between the tires and pavement, will cause the exact same lateral acceleration when the bike is racing down the track as when it is stationary at the start line. Because the wheels act as gyroscopes, this countersteering leans the bike in the opposite direction (into the turn). As already discussed repeatedly here, Professor Cossalter in his excellent Motorcycle Dynamics, on page 304 of the second edition, calculates the roll moment generated by gyroscopic effect for a motorcycle traveling at 22 m/s (79 km/h or 49 mph) to be 3.5 N-m (2.6 lb-ft) and compares it to the roll moment generated by the accelerating contact patches of 30 N-m (22 lb-ft), which is 8.6 times larger. He concludes with the note that the gyroscopic effect is present from the instant torque is applied at the handlebars, and the roll moment generated by the lateral force of the tires can take some time, ~0.1 seconds in this example, to build up. the tires at an angle, narrowing what engineers call the contact patch and making the bike easier to turn. But there really isn’t even enough information there to decide what is wrong with it. but it appears Mr. Edwards was left standing at the starting line. SchoolPhysics Online, by Keith Gibbs, considers itself to be “an invaluable resource base for all 11 to 19 year old physics students and their teachers.” That may be true, unless those students and their teachers wish to learn about why a bicycle is easier to balance when it is moving forward than when it is stationary. This one is a case of the conservation of angular momentum. Unless the bicycle is free falling in the vacuum of space, it will experience externally applied moments, and angular momentum will not be conserved. Now a stationary bike wheel has no angular momentum and so does not need a force to change the direction of the axle – in other words the bike can easily fall over. However the rotating bike wheel has angular momentum and so requires a force, in some cases a considerable one, to make the axle of the wheel change direction, and so the wheel stays upright. Of course, it is not a force that can cause the axle of a wheel to change direction, but a couple or moment, and the existence of angular momentum is not what necessitates a couple or moment in order to change the direction of an axle, just a non-zero mass moment of inertia. Then, if the wheel is spinning, so that it also has angular momentum about its axle, the axle does not resist changing direction in response to an applied moment, it just changes direction in a different way, by precessing about an axis at right angles to both the axle and the applied moment. If it is not free to precess about this third axis, as is the case of the rear wheel if the tires are in contact with the ground and the front wheel if the steering is locked, then it will respond to the applied moment as though it were not spinning at all. Instead, the feature that all ridable bicycles have in common, regardless of their geometry and mass distribution, is the ability to steer, and the current answer needs to go back to the drawing board before any more physics students or their teachers get a bum steer. This article by Dwight E. Neuenschwander, a professor in the Physics Department at Southern Nazarene University appears to have been published in the SPS Observer, the quarterly magazine of the Society of Physics Students (SPS) published by SPS and the American Institute of Physics (AIP). No publication date is given, but the article is currently hosted on the SPS Observer web site, which also hosts issues back to 2002, but no way to search them for a particular article or topic. If you lean to the left, the motorcycle turns left (likewise on bicycles). Why is this so? … This induces a nonzero torque … Hence the angular momentum vector L rotates about a vertical axis, and the motorcycle precesses to my left. Not just the front wheel precesses, but the whole motorcycle. No mention is made of steer angle, steer torque, or even friction between the tires and pavement. The whole bikes just yaws by the magic of gyroscopes! Of course, no such thing happens. Instead, there are two possibilities. Either the front wheel is free to precess about the steering axis, does so to steer in the direction of the lean, and the friction between the tires and the pavement generate a yawing moment on the bike. Or the front wheel is not free to precess and the roll moment generated about the contact patches by the force of gravity acting on the center of mass simply causes the bike to roll until it strikes the pavement. Gyroscopes are not magic after all. Hmmm… further research is needed…. We don’t need any further research like this. What is really needed, instead, is reading up on the topic before writing about it. Sharp’s seminal paper on the Stability and Control of Motorcycles has been available since 1971, so the information is out there. Technical correctness is necessary, and contributions should … significantly aid the learning of physics. As I was riding my 650 cc motorcycle, I discovered a curious fact which might be useful to those who would like to have an everyday example of gyroscopic action. The curious fact he discovered is that is necessary to countersteer his 650 cc motorcycle, and the rest of the article is devoted to explaining what countersteering is and how gyroscopic precession works. No mention is made of any other phenomenon. Thus, without so much as a back-of-the-envelope calculation or controlled physical experiment, he asserts that gyroscopic precession is how and why big bikes such as his 650-cc machine countersteer, and even goes so far as to call it gyroscopic turning. This implies that single track vehicles without spinning wheels can’t or don’t countersteer. How does he propose that such vehicles generate the roll moment necessary to negotiate a turn? Well, if Higbie had done a little math after his exciting ride and before dashing off his manuscript , he would have discovered that gyroscopic effect makes a small contribution to the total roll moment which is quickly overwhelmed by the contribution from the lateral acceleration of the tire contact patches and then from the contribution from gravity acting on the center of mass which is no longer over the contact patches. As I have written before, there is a nice example provided by Professor Cossalter on page 304 of the second edition of his excellent Motorcycle Dynamics. He calculates the roll moment generated by gyroscopic effect for a motorcycle traveling at 22 m/s (79 km/h or 49 mph) to be 3.5 N-m (2.6 lb-ft) and compares it to the roll moment generated by the accelerating contact patches of 30 N-m (22 lb-ft), which is 8.6 times larger. He concludes with the note that the gyroscopic effect is present from the instant torque is applied at the handlebars, and the roll moment generated by the lateral force of the tires can take some time, ~0.1 seconds in this example, to build up. This example of gyroscopic motion is sufficiently involved and “relevant” that it could be useful in first-year college or high school courses. Sure, unless anyone checks the math and discovers that gyroscopic precession is neither necessary nor sufficient for a bike to countersteer. Then this becomes an example of how misconceptions get perpetuated. 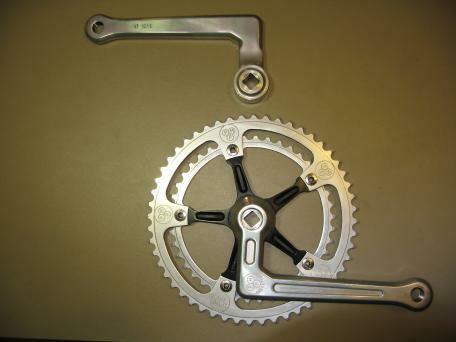 A moment’s thought shows a straight crank and an L crank always have the same relation between pedals, chain, and bottom bracket. Thus, there is no advantage to L cranks. And an L crank always has more material than a straight crank, so is always at a disadvantage for weight, strength, stiffness, and/or cost. This is pretty good confirmation of the line about the rate at which suckers are born, no matter who said it.